I ooh and aah over all the pretty planners out there. I need a planner (I hear my mom saying right now "Yes, you do!") But I just don't have the time to go all out, so I have a system where I only spend about 30 minutes at the beginning of each month getting the whole month ready to go. I need it to be cute enough that I can stand looking at it, but don't want to spend a lot of time getting it there! I've had a couple of emails lately asking if I keep a planner and how I set it up. I put together a quick video showing what I do at the beginning of each month. I also show how to make this cute pocket I keep in the front to hold my To Do lists and sometimes my pens. Like I said, I don't do a whole lot. Just make my To Do Lists and decorate a little with washi tape and maybe a stamp or two. Can you spy the little red butterflies? I even keep the same place keeper every month: my little black cat. I do change his ribbon to match the month's page colors. In the video, I'll show how easy it was to make him too! Even though I have a planner, I still forget things! Usually because I forgot to write it in my planner to start with. Do you keep a planner? Do you have some suggestions to make it easy and functional? I would love to hear from you. Have a lovely week (and if you have a planner, don't forget to write something down)! 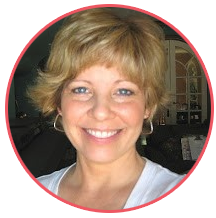 Looks good, Lori! I don't have a planner but I'm considering one for 2017 if I can find a good bargain! I like your simple set-up. Thanks for sharing how you made the pocket. 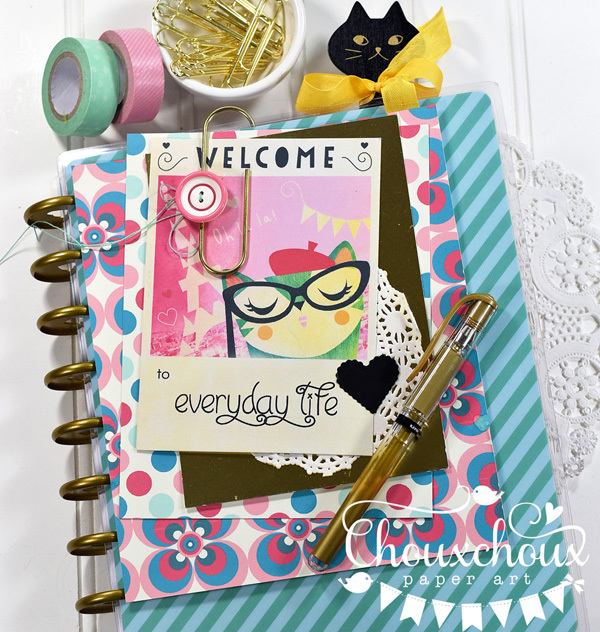 I like your kitty embellishments and cat page marker! Great video! 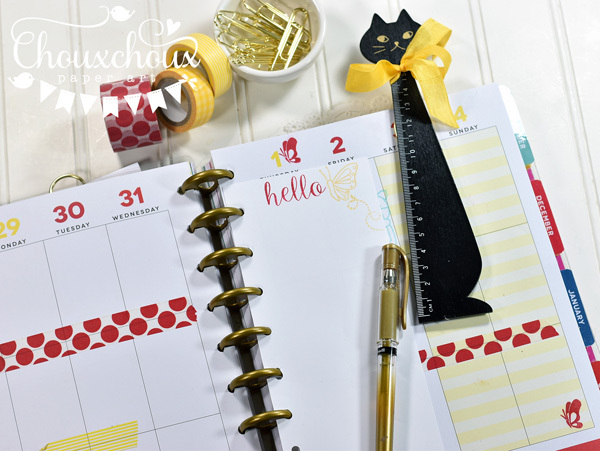 Your planner is so cute, Lori, & love how you've kept it simple! The pocket is a great element--thanks for showing how you made it. I don't use a planner--pretty simplified life since I'm practically retired now--but I keep admiring the ones with beautiful covers. I'd have that instead of what I used to use if I still worked--but I'm glad those days are done! Wishing you a great week--we've got a lovely cool down! Just realized I could use a planner for cardmaking! Maybe I'll get one after all! Lovely planner Lori - I love all the cute decoration. I don't buy expensive planners because I'm too scared to spoil the pages LOL. 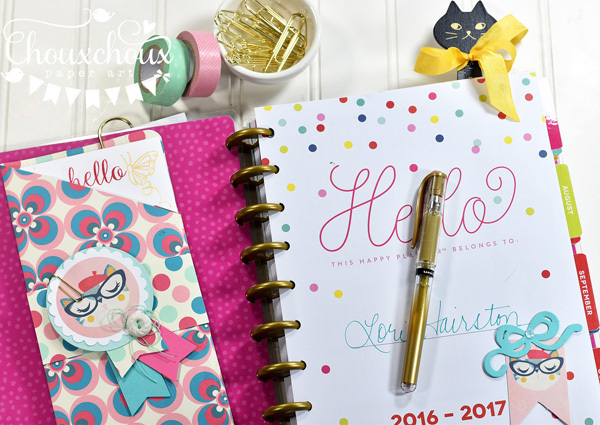 Your planner is absolutely adorable, Lori! Really love your tips for keeping things simple. Awesome pocket and love how you use the washi tape. That kitty cat ruler is so, so sweet. LOVE the little french kitty on the cover, too! Great video! TFS! What an awesome planner Lori, so many beautiful details! 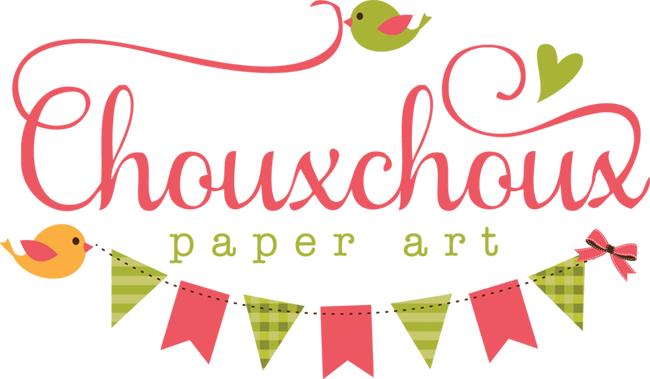 Gorgeous papers and I love that fun cat ruler!! so pretty! Love your place keeping kitty! Have to see how you made that...I have a planner...I'm terrible at writing in it...sigh. Maybe your video will help me! Can't watch it now though....bedtime and hubby won't appreciate it...lol...have yo watch this weekend...have to remember.... Where is that darn planner when I need it?? ?...lol..